places, talk with friends and strangers, and write some more. “Writing the Rails” was the unofficial name I gave to the trip and also to the journaling I did along the way. An excerpt from my summer travels, the opening of my journey. 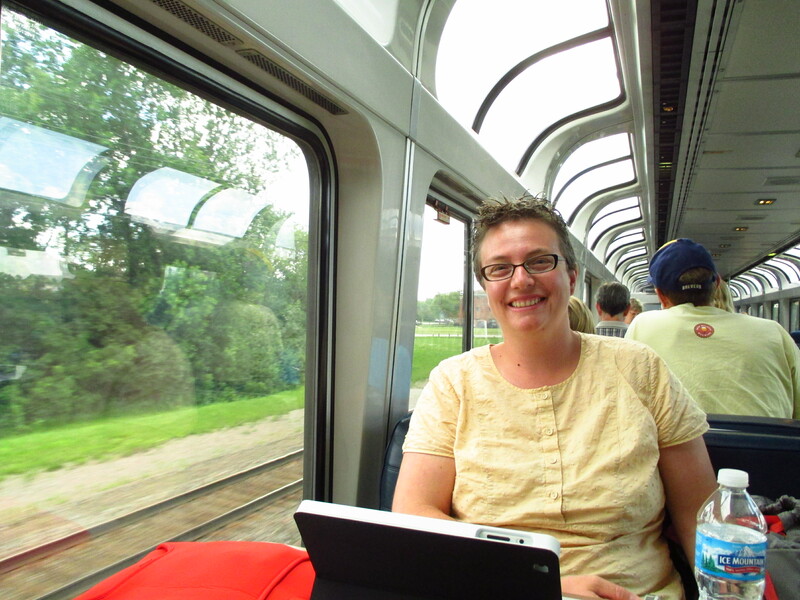 Just minutes ago, my dear friend and fellow writer Mary Catherine Harper (MC to me) boarded Amtrak in Bryan, Ohio, and are now hurtling towards Chicago. Mentally I am trying to catch up to the reality that, yes, I am going on this grand adventure, and that the decisions to be made on the homefront can wait until I return. Wishing for the decisions that remain behind that there were just one perfectly clear direction in which to move forward–like riding a train. 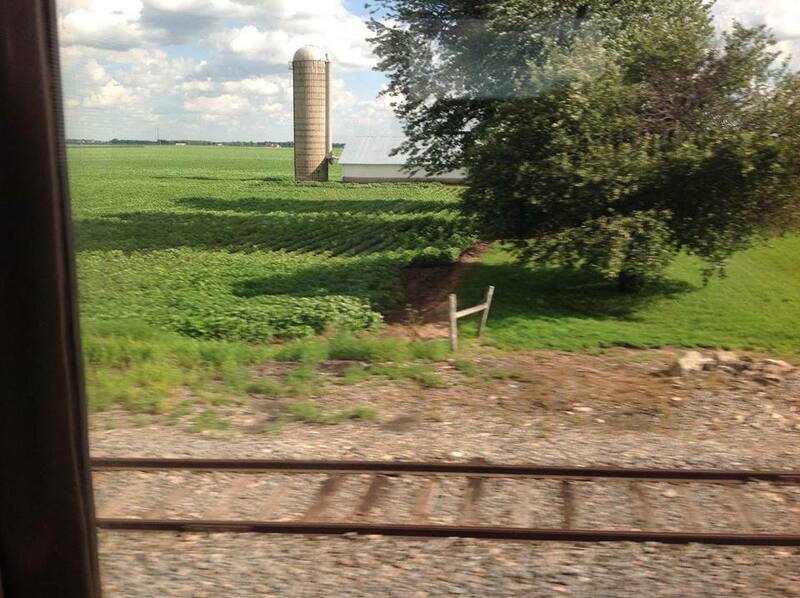 Passing between fields of green Indiana corn, the charm of riding coach has yet to fade, as I know it will eventually. This is not the first time I’ve ridden a train, after all, and I certainly don’t plan on it being my last, no matter how infrequently I have such an opportunity. Fellow passengers play on phones and tablets, their headphones keeping their minds engaged in their own little worlds even as their bodies move West along with mine. For being so full of people, the train is quiet with only the occasional “Mommy! Mommy!” from several rows up. Passengers sleep, or try to, wrapped up in blankets from home. Sitting next to me by the window, a man headed to New Orleans to see his children. He is younger than me, reddish hair, black glasses. Blue jeans and red and black striped polo. Beyond him, the window, and outside a woods I am passing through. I sway gently back and forth as the train slows, the brakes squeal, and a conductor walks through checking destinations on slips of colored paper–green and orange–above seats. Kendallville, reads the water tower now within view, a marker of where I am in the world at this moment, and the familiarity of Indiana town names to this native Hoosier eases my spirit and I feel somehow like I belong. This may not be my hometown, but I am moving towards it, as I must to get to Chicago. Outside the window to my left, a green park sectioned off in soccer fields. Outside the window to my right, a metal recycling lot with jagged silvery scrap jutting out from the heap at inevitable odd angles, and beyond this anarchy of scrap nonconformity, compressed blocks of scrap, cubes of packed metal awaiting fire, leftovers longing to be made into something new. And now the backyards. The blue above-ground pools and the tidy Indiana gardens. Orange trumpet vine climbs over brown picket fence just as it always climbed the wire fence separating my childhood home from U.S. Highway 30. Trumpet vine always does what it wants, climbing fences and houses, clogging septic systems and popping up through floor registers, its bold orange flowers its one saving grace. The Moose Lodge, the Kendallville Pawn Shop, the abandoned factory of steadfast brick and broken windows, the painted black and white “Office” sign fading into the dull red brick that underlies everything. Slowly, slowly, we pass under a highway and out the other side, and again the fields and the green, a crane in a marsh, a church, and a hospital, orange windsock giving a sign of the wind’s direction. I like best the green fields and marshes, the staccato of dead trees rising from the still water. The green surrounds and calms me, but the buildings and the people, they surrender untold stories. I am on a train and I am traveling. I will hear and I will write stories.